Two Harley Davidson Rides for the price of one! Put on a leather jacket and helmet (supplied!) 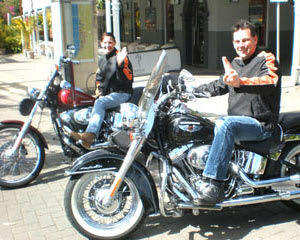 and prepare for a two-bike 60-minute Harley Davidson motorcycle tour around Brisbane. Two Brisbane Harley Davidson Rides for the price of one! Please note that both rides must be booked and taken on the same day. Leather jacket & helmet supplied! Put on your leather jacket and helmet and prepare for a two-bike 60-minute Harley Davidson motorcycle tour around Brisbane. You and your companion will go for a sensational ride around the city, seeing the most popular attractions along the way. Get set for a double Harley Davidson motorbike blast! On the day of your experience we will pick you up from Brisbane City or Southbank. Imagine the looks on the faces of your family and friends as two rumbling Harley Davidson’s arrive to take you and your partner for 60 minutes of sightseeing around Brisbane! Our Harley Davidson motorcycles are equipped with high backrests, comfy seats and running boards for your feet. During your ride you will get to experience a range of different styles – from riding down the freeway to taking corners on winding hilly roads on Mt. Coot-tha. You’ll be grinning with excitement for hours and talking about this experience for years to come - life should be full of these experiences! The people who took us for a Harley ride were great. More than just a ride. We had the best time - the riders Libby and Peter were so lovely and approachable. We would definetly recommend to others! Great ride, great companion riders, informative, obliging and felt very safe. Totally fantastic experience. Thanks Pete and Libby?? It was a great way to celebrate Mum's 70th Birthday and tick one more thing off her bucket list! She never stopped laughing for the entire trip and could not wait to tell all her friends. Pete and Libby were great hosts and we can recommend this adventure with great confidence! I was really nervous at the start but Libby's reassurance and advice soon had me enjoying the ride. What a great experience! !